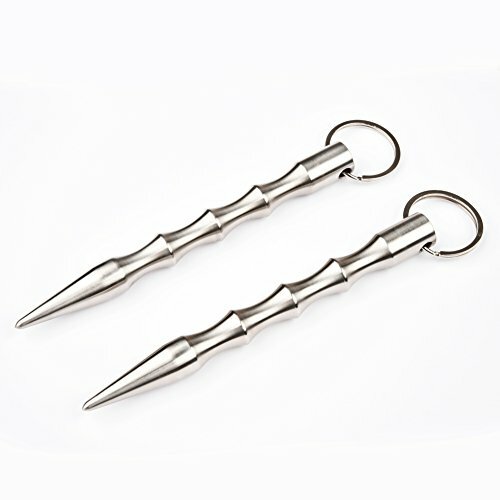 We wish you never had to use this self defense baton keychain, but it's necessary to have one on hand, just in case. Caifede stainless steel keychain self defense is a concealed weapon to carry on your key ring or handbag. This is a kind of invisible self defense weapon,which's small size and easy to carry,it is strong,tough and powerful to use especially in difficult situations,and will be handy in the event of an attacker Great gift for girls or children to protect themselves. It is advisable not to bring on the plane,just in case. You will like the weight and the feel of the grip. If you want to buy, consult your local law. If you put it in a keychain or a car engine, it might be a bit big, please buy it carefully. I'd recommend watching a video on how to properly use one in self defense, or take lessons with it. These can be extremely effective! Material: The self defense weapons keychain is made of solid stainless steel ,Not aluminum alloy Length:5.5 in, Max diameter: 0.55in, Weight: 5.3ounce. How to use: When you are in danger, grab the guard key chain and rush to the enemy at one end. This will hurt the enemy. More use：Lifesaving hammer broken car window, Outdoor travel and the necessary tools for survival in the wild can be dug or poked ,a company seminar to instruct the whiteboard, a tactical pen, press the elevator button,and explosive power to do a lot of things for you. If you have any questions about this product by Caifede, contact us by completing and submitting the form below. If you are looking for a specif part number, please include it with your message.